Most patients with chronic instability give a clear history of one or more ankle injuries. However, some, especially those with varus or cavovarus deformity, develop symptoms of ankle instability without injury. 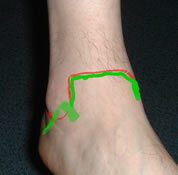 Typically patients complain of repeated giving way of the ankle which is usually painful. Swelling may accompany episodes of giving way. Giving way is often commoner on slopes or uneven ground. In some patients the predominant complaint is pain or locking: this should raise a suspicion of intra-articular pathology such as an osteochondral fracture. Tenderness is usually maximal over the lateral ligament, often the ATFL only. A few also have localised tenderness over the deltoid ligament; these tend to have more complex injuries. Some patients have rather generalised joint line tenderness, palpable synovitis or an effusion. Tenderness or swelling over the Achilles, peroneal or tibialis posterior tendons should be identified. There is an association between ankle instability and peroneal tendon instability: the patient will usually complain of snapping or giving way over the peroneal tendons and instability is maximal on plantarflexion/eversion. Instability is demonstrated with the anterior draw and tilt tests. The anterior draw test should be done with the ankle in 20deg plantar flexion (Bahr et al 1997 – a cadaver study, Corazza 2005). The tibia may be pushed posteriorly against a fixed foot or the foot drawn forwards. The characteristic positive sign is a "suction sign" as the synovium is sucked into the joint drawing the skin inwards in the lateral gutter. However, in many patients there is no suction sign but the talus can obviously be drawn anteriorly more than on the other side. The talar tilt test is conventionally performed by tilting the hindfoot and looking for a suction sign or asymmetrical movement. It should be done with the ankle plantigrade (Bahr 1997). Palpation of the talar neck will assist in differentiating between movement in the ankle and the subtalar joint. No clinical work has been done to examine the accuracy of the draw and tilt tests. Van Dijk et al (1996) studied diagnostic strategies for lateral ankle ligament disruptions. They found the most reliable test was clinical examination of the ankle by a senior orthopaedic surgeon after 5 days (to allow swelling and pain to improve). The sensitivity of this procedure was 96% and the specificity 84%. Examination after 5 days by a well-instructed trainee was almost as accurate. No diagnostic imaging was as accurate as the clinical examination although the cost was much higher. Examination at the time of injury was also less accurate, although this was not by senior staff so is not strictly comparable. The study considered only patients with acute ligament tears and the gold standard was surgical exploration. Examination by other personnel such as physiotherapists was not studied. This study gives strong support for a primarily clinical approach to diagnosis of these injuries. It is important to identify underlying causes of chronic instability. In particular the overall foot shape should be evaluated, looking particularly for hindfoot varus, and an adequate neurological examination should be performed. The shoes will give information on heel contact. Generalised joint laxity should be sought. Examine the syndesmosis. The most accurate test for syndesmotic injury is the external rotation test. The tibia is stabilised and the hindfoot externally rotated. Pain felt in the syndesmosis is a positive test; actual instability os not usually detectable. In the chronic injury, pain in the joint line is often due to impingement from post-traumatic synovitis, sometimes exacerbated by a spur on the tibia or talus. This can be demonstrated with the Molloy/Bendall impingement test (Molloy et al 2003). A finger is placed in the joint line and the ankle dorsiflexed, producing or increasing the pain. This should be tried across the anterior joint line and in the medial and lateral gutters. Pain which is worse on palpation rather than dorsiflexion, especially over the talar articular surface, should suggest an osteochondral lesion.